Abby Lovitt went to a show with her horse True Blue or Blue. After the show, world champion rider Peter Finneran hosts a clinic at the show barn. Blue was a cheap horse, $5.60. 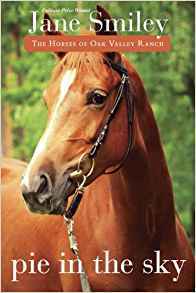 Peter Finneran doesn't like the potential of Blue so Sophia and her family lend Abby a horse that cost fifteen thousand dollars, Pie in the Sky. Sophia is one of the riders in the Peter Finneran clinic. Sophia and Pie in the Sky don't get along so Sophia's dad bought Black George from Abby's breeding barn. Black George can jump five feet. Soon Sophia's family hires Abby to ride Pie in the Sky as a professional.Sophia quits riding because how bad Peter Finneran yelled at her. Abby uses her money to buy lessons with Blue, but Sophia's dad arranged that Abby rides Pie in the Sky so Abby won't have to pay. Abby just wants True Blue to become a better horse. At the lesson, the instructor starts ground work. While watching, Sophia learns that trust is the most important thing as horse and rider. She and Pie in the Sky bonded and Abby's work with Sophia family is over, but that doesn't stop their friendship. Pie in the Sky is the most recent book Jane Smiley wrote. Jane Smiley also wrote many books for adults including the award winning A Thousand Acres.